Glucosamine gel is a unique massage gel which contains all-natural glucosamine, a major structural component within joint tissue. 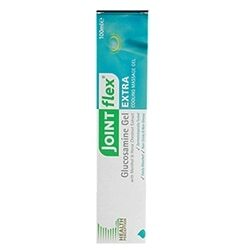 Jointflex daily is ideal if you want to take an everyday glucosamine supplement at low, gentle doses. Also enhanced with other important nutrients including Vitamin C, manganese, menthol and horse chestnut extract. Apply a thin layer of gel where needed and gently rub in until absorbed. This can be repeated up to six times a day. For additional benefits, keep the gel in the fridge and apply after a warm bath. Aqua (water), Alcohol denat, Acetyl Glucosamine (NAG), Propylene Glycol, Aesculus Hippocastanum (Horse Chestnut) Seed Extract, Menthol, Carbomer, Phenoxyethanol, Sodium Hydroxide, Methylparaben, Butylparaben, Ethylparaben, Propylparaben. Not suitable for children under 12 years. Pregnant and breast feeding women should consult their doctor before using this product. Do not use near eyes or on cut, broken or infected skin. Do not use if sensitive to any ingredients. Not suitable for use on intimate areas. Health Perception Glucosamine Gel is rated 4.7 out of 5 by 7. Rated 5 out of 5 by Sammysam from Best alternative to NSAD If you do not wish to use a non-steroidal anti-inflammatory drug this is a marvelous alternative. Gives amazing relief to joints and muscles. Highly recommended. Rated 5 out of 5 by Segs from Excellent product, very pleased with it. I have been using this product for some time and have found it a great help in relieving my condition. Rated 5 out of 5 by Nadz from Good results My grandfather has been using this product for many years and always requests more from me since he lives overseas and this isn't available out there. He says this product gives good results and helps tremendously with his joints.